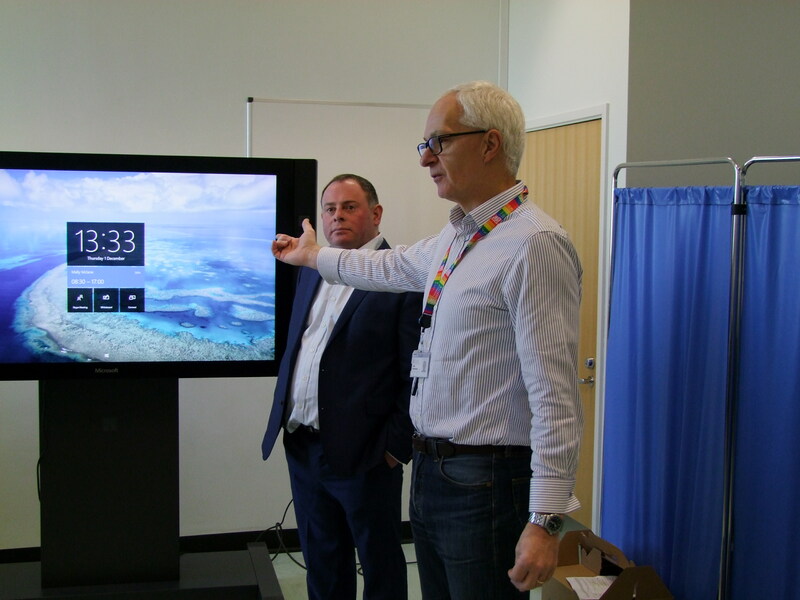 The faculty of Health Sciences has started a trial of Microsoft’s new Surface Hub for the MBChB medical programme. Working with UoB Information Services, we have installed 4 of the 55” Surface Hubs; 2 in our Clinical Academies, North Bristol (Southmead hospital) and Somerset (Yeovil District hospital) and 2 at the University, Centre for Comparative and Clinical Anatomy and the University’s Simulation centre. The Surface Hub comes with 2 electronic pens so teachers and students can draw and manipulate right on the screen with no obvious time lag. This is already being used in anatomy sessions where the groups of around 10 students can choose the electronic radiograph images they want to explore in detail and then take turns to mark up the image with the points they have been discussing in their teaching. Early trials show that the students love using the technology. Without any instructions, they just picked up the pens and started drawing and manipulating the images. Once they have finished they then can save their work as an image or OneNote document. The Surface Hub is set up to work with Microsoft’s Skype for Business Video Conferencing (VC) and comes with built-in cameras and microphones. Using VC, we are planning to trial teaching with the Surface Hub from one Academy to another which will enable a clinical expert to teach across multiple sites at the same time or will enable a remote clinical consultant or subject specialist from an Academy to complement a teaching session at the University. Another key aspect we would like to explore is using the VC to transmit interactive science teaching from campus to multiple Clinical Academies. The Health Sciences TEL Team works closely with: University of Bristol TELED (Technology Enhanced Learning and Educational Development).